The Cibeles Square is found at the intersection of Alcala Street (which crosses from west to east), the Paseo de Recoletos (heading north to link up with the Paseo de la Castellana) and the Paseo del Prado (south, towards the fountain of Neptune). This place, one of the most symbolic of the capital, divides the district boundaries Centro, Retiro and Salamanca. In the center of square, is situated the famous fountain of Cibeles, sculpted in 1782, from a design by Ventura Rodríguez. It is a neo-classical complex of marble sculpture that has become an iconic symbol for the city of Madrid. The fountain of Cibeles has been adopted by the Football Club Real Madrid, whose fans use the area to celebrate its triumphs in competitions. Each of the four corners of the square is dominated by landmark buildings, built during the late 18th and early 20th centuries. This fountain, named after Cybele (or Ceres), Roman goddess of nature, is seen as one of Madrid's most important symbols. 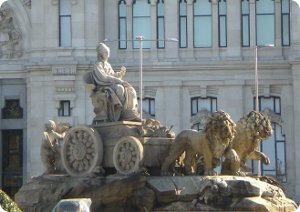 The Cibeles fountain depicts the goddess, sitting on a chariot pulled by two lions. The fountain was built in the reign of Charles III between 1777 and 1782. The most prominent of the buildings at the Plaza de Cibeles is the Cibeles Palace (formerly named Communications Palace). The cathedral-like landmark was built in 1909 by Antonio Palacios. 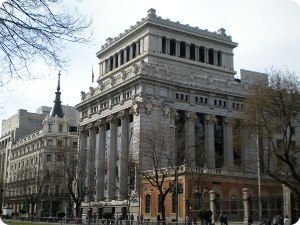 In 2007 the landmark building became the Madrid City Hall. View more info in this link: Madrid City Hall. Facing the Cibeles Palace. Built in 1777 by the Duchess of Alba with designs of Pedro de Arnal. Surrounded by a French style garden by Ventura Rodríguez. The Crown owned it after the death of the Duchess of Alba. In 1939 it was ceded to the Spanish Army to host its headquarters. Opposite the City Hall (Cibeles Palace), crossing the Paseo del Prado, is the Bank of Spain. Also is found opposite to the Spanish Army Headquarters (Buenavista Palace). The oldest part of the enormous building, bordering the Cibeles square, was built between 1882 and 1891. Formerly named Palace of the Duke and Duchess of Béjar. 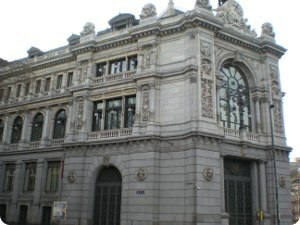 Opposite the Bank of Spain is the Linares Palacio. The baroque palace was built in 1873 by a rich banker, José de Murga. View more info in this link: Linares Palace.